Looks like a Shane dust-up brewing. This is what lightning-pace Internetting can do to announced Blu-Rays ... put them in controversy's column when there's hint of a foul-up, which we've apparently got here thanks to Paramount intent for a 1.66 ratio in accord with Shane's premiere at Radio City Music Hall and other first-run sites. Greenbriar visited this topic back on July 12, 2009, wherein a 1953 ad for ersatz Shane showed how public clamor for w-i-d-e screens led to fudging on the part of distribution and certain exhibs. 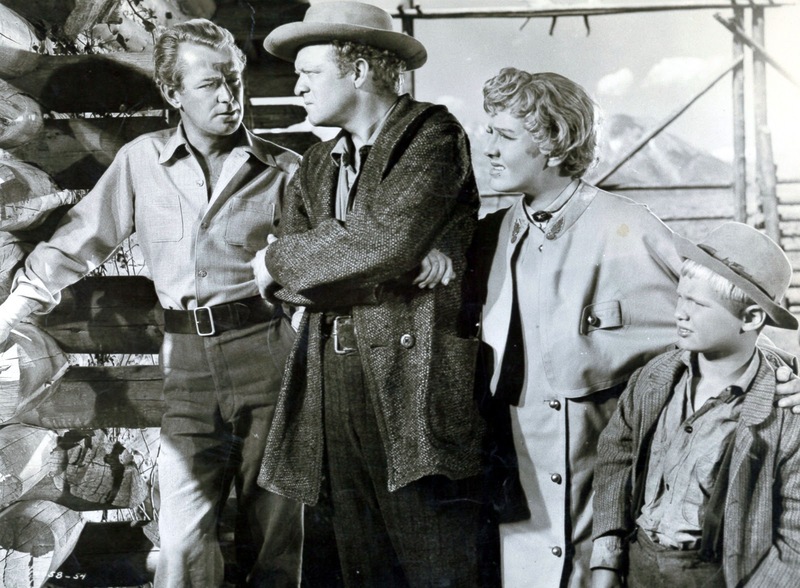 Did director George Stevens, who had shot the film several years earlier in full-frame, endorse such a stretch? He did not, but how to protest Para's bollix when they're signing your paychecks and at verge of sharing percentage of what shaped up to be a huge hit western? Stevens went on promotion tour for Shane. The decision to release it wide had been made, and everyone was happily on board. There weren't so many purists around in 1953 like we have now. Would they have made any difference? Can modern-day purists make a difference in 2013? For the record, I absolutely think Shane should be released in 1.37, or at the least, as viewing option on a two-ratio disc that would quell controversy by letting us choose which version of the show to watch. What's happening is reprise of 1953 panic for expanded screens. Now that televisions are being sold with wide view, programming is being pulled like taffy to fit them. Ever watch TNT or other networks where images are freakishly stretched to avoid dreaded black bars on left and right of your screen? There's perception today that we want every inch of TV real estate filled with image. Wide sets may lead to altogether finish for broadcast of old movies, leaving us with survivor discs and whatever gets streamed. Should full-frame Shane issued earlier on standard DVD now go in safety deposit boxes? George Stevens filmed Shane long before an industry went widescreen daffy. Release just six months earlier would have spared everyone a muddle. 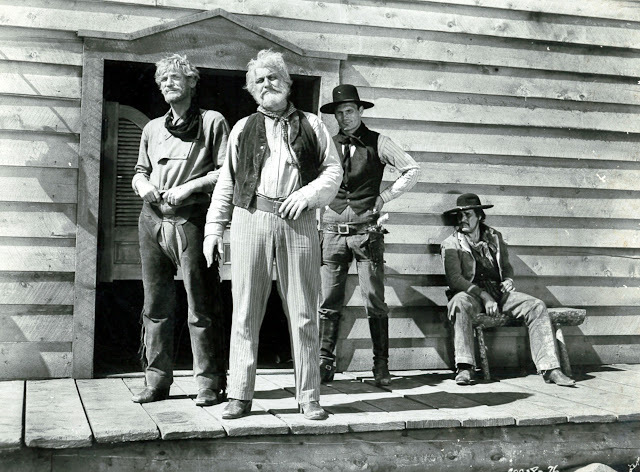 Trouble was the stretch-screen gold rush in full press just as Paramount set dates for their $3.5 million investment. 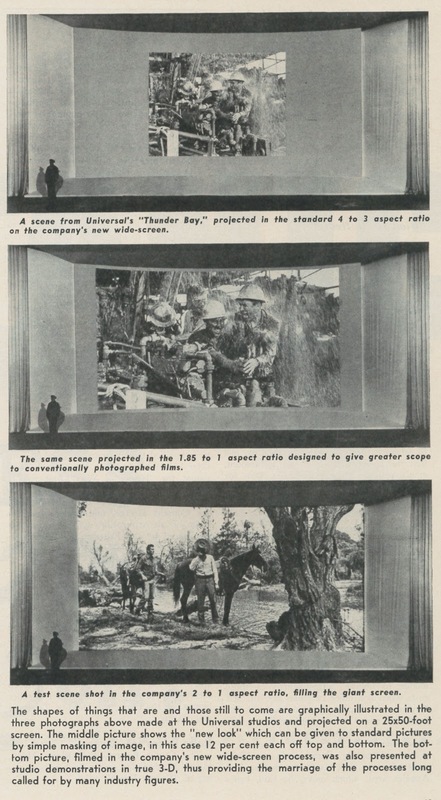 Variety reported (4/8/53) distribution's decision to inject added value into a conventional 2-D pic via the widescreen treatment. 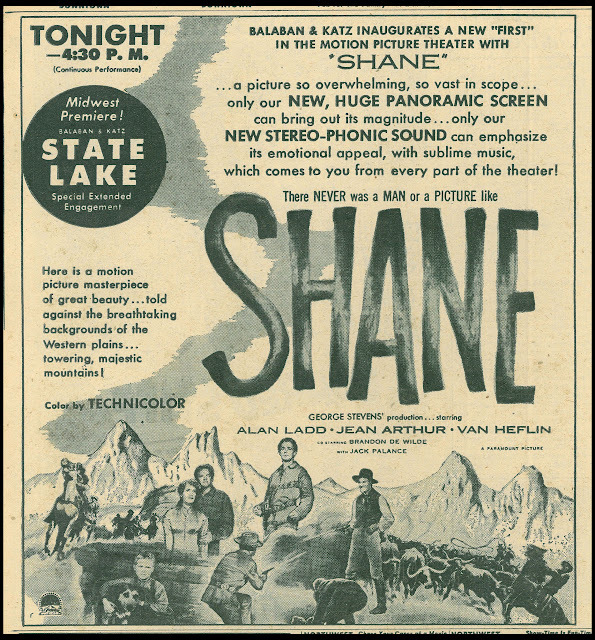 Para ran a widened Shane to West Coast reviewers that week in anticipation of opening later in April at New York's Radio City Music Hall. Other companies were up to same tricks. 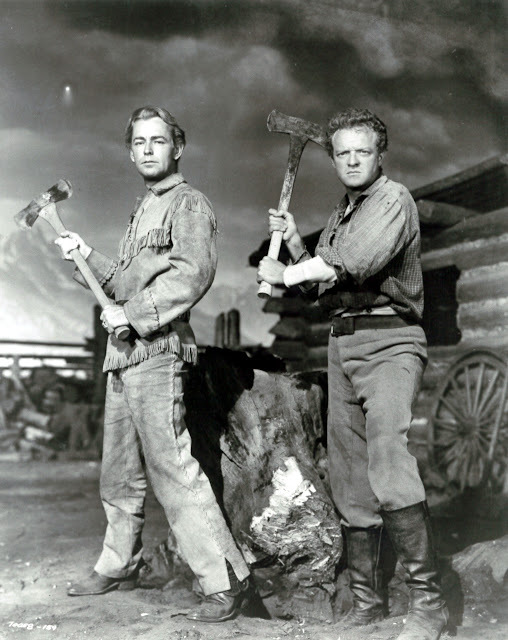 Universal-International had given Thunder Bay the wide treatment, despite the film having been shot on standard ratio. 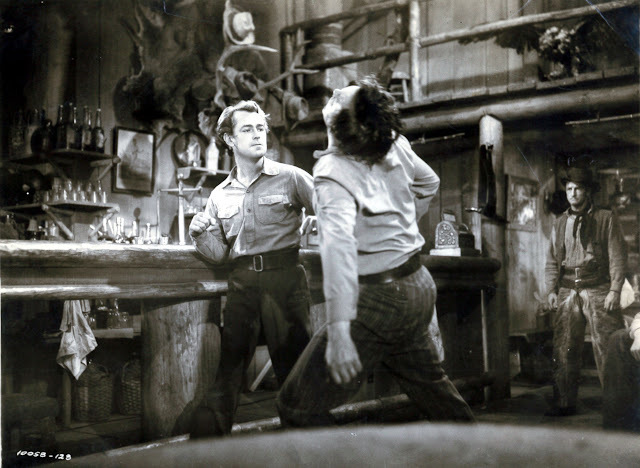 Tops and bottoms of the frame were skimmed off, and clarity was sacrificed to blow-ups, but would audiences cry foul? A committed industry put money on novelty's distraction from the cheat this was. 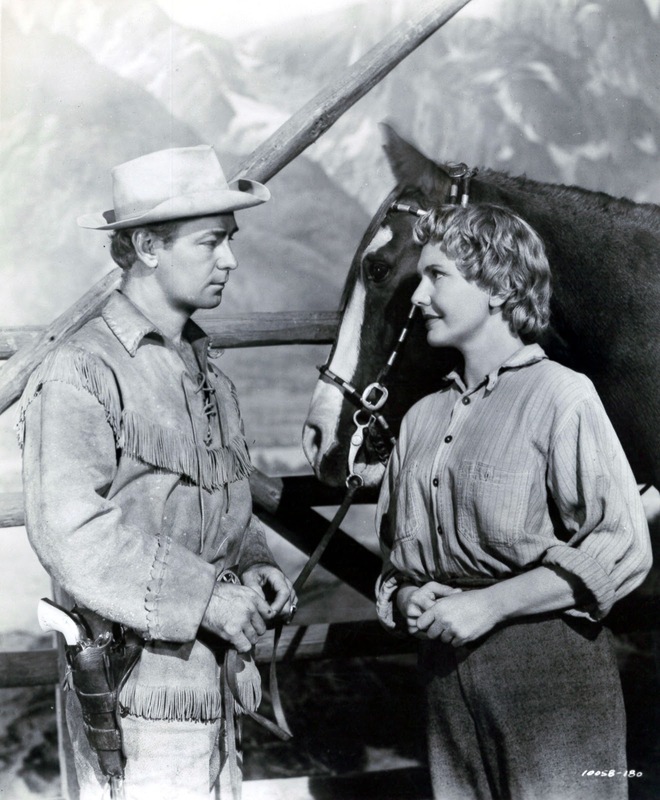 Hedging bets, Paramount announced withhold of Shane from general release to see how first-runs worked out. It would be mid-summer, they said, before neighborhoods got their super-western. Ratio. Right or Wrong, It's a Brand, and The Brand Sticks"
Straight-shooter Pete Harrison, of plain-spoken Harrison's Reports, was first to reveal truth of Para's plan. Pete was present at the critic unveil in April and saw the jerry-rigged Shane. It was necessary to reduce the projector aperture plate opening so that the picture had shorter height, with the result that part of the top and part of the bottom had to be cut off, and the enlargement of the picture, by use of a wide-angle lens, reduced the sharpness of the photography, said Harrison. The picture would not have lost any of its effect upon the spectator had it been shown on a regular screen and projected through the standard aperture, for when one becomes absorbed in the subject matter one loses oneself in the illusion and does not pay any attention to the size of the screen. Harrison felt that distributors were trying to salvage a backlog of conventional films in which they had millions invested, him being one observer who could speak truth to power because Harrison's Reports didn't take ads from Paramount or any of the film companies. Would These Lowdown Yankee Liars Endorse Shane in 1.66? Other trade publications, always eager to play ball with ad-purchasing producers, kept criticism down to a whisper. 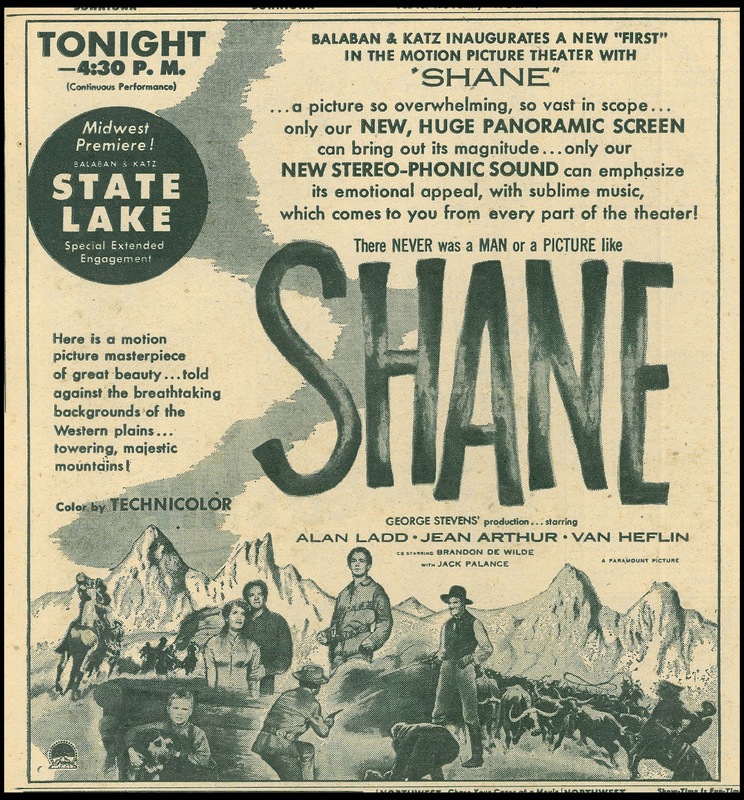 Variety's "Inside Stuff --- Pictures" column of 4/29/53 made tactful reference to New York's opening: Radio City Music Hall, N.Y., preemed Paramount's Shane on its new, flat 50X30 screen last week (4/23) and came up with what's regarded as a definitely improved pic, particularly in the scenic shots in which the George Stevens production abounds. Screen's 1.66 to 1 aspect ratio occasionally clipped images top and bottom and a certain amount of light loss was noticeable, particularly in low-key scenes, but these are figured minor blemishes. Size of the Hall makes the larger surface so acceptable that it's difficult to imagine a smaller screen ever having been in use there. Should Blu-Ray purchasers now accept a Shane with said "minor blemishes" as referenced by Variety in 1953? Part Two of Shane is HERE. 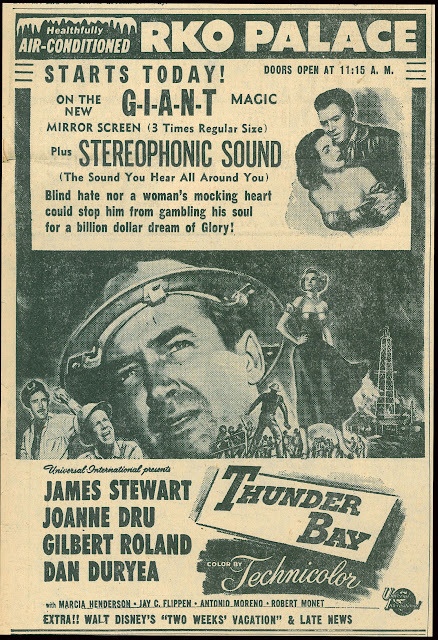 It's worth mentioning that many 1.37:1 titles were caught in the eye of the storm during the widescreen revolution in the spring of 1953. However, starting with Paramount in mid-March, all new productions were designed and composed for the wider canvas. Mr. Furmanek makes an excellent point about flat titles on the market in early 1953. Cinemascope on the horizon may explain why Fox released the standard-ratio STARS AND STRIPES FOREVER during the Christmas season of 1952; it would have been old-hat by the summer season of 1953. Why was SHANE in the can for several years after filming, as you say? George Stevens was very slow and painstaking with post-production on all his productions. It was not unusual for him to spend a year in the editing room with the miles of film he shot. Has anyone else ever noticed that the standard DVD release of Shane available for some years now changed the soundtrack of the film's famous ending? 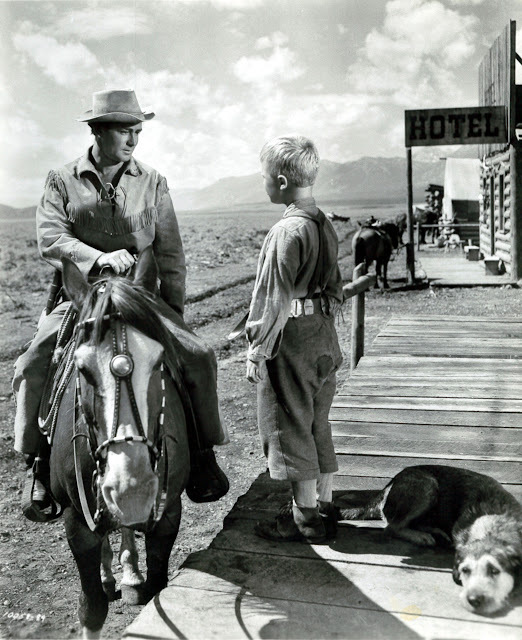 In the film's original ending, as immortalized on screen, the wounded Shane is seen riding towards the mountains as the young boy (played by Brandon de Wilde) calls after him to come back. Originally, the boy's last words heard, softly but distinctly for those who listen carefully, were, "Bye Shane." Those two words were, in fact, the last two in the film, occuring with about ten seconds left in the movie. I always found the young boy's final words to be quite poignant, signalling that at the last moment he realizes that his hero is not returning. In the DVD release, however, Victor Young's musical score is cranked up so loud at that moment that the words are virtually drowned out. Whether this was an intentional act or, more likely, a clumsey accident by a sound person not as familiar with the soundtrack as he should have been, I don't know. I always found it exasperating, however, that the ending of this masterful western was tampered with, particularly since George Stevens Jr. was involved in the DVD release. I have never, however, heard of either Stevens or anyone else complaining that the film's final two words for years, "Bye Shane" could no longer be heard. 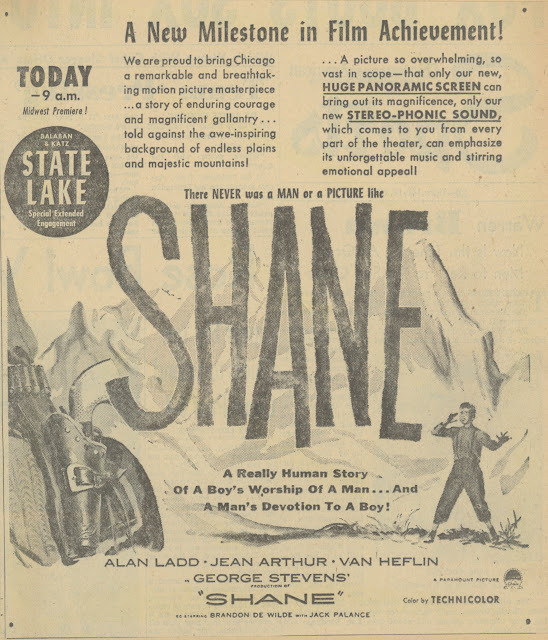 Stevens was editing SHANE between November 1951 and March 1952. It's a shame those last two words are drowned out in the mix now. Somebody was sloppy when they went back to the separate dialogue, music and effect tracks. I agree, let's hope that's fixed!